The bulk of the Turkish navy fleet returning from the largest naval drill in its history enlivened a long forgotten Turkish maritime tradition as they saluted the tomb of the most famous Turkish sailor of all ages. Sailors of TCG Barbaros frigate, one of the main warships of the Turkish navy named after Barbaros Hayreddin, salute the Ottoman sailor's tomb as they are cross the Bosporus off the coast of Beşiktaş district. 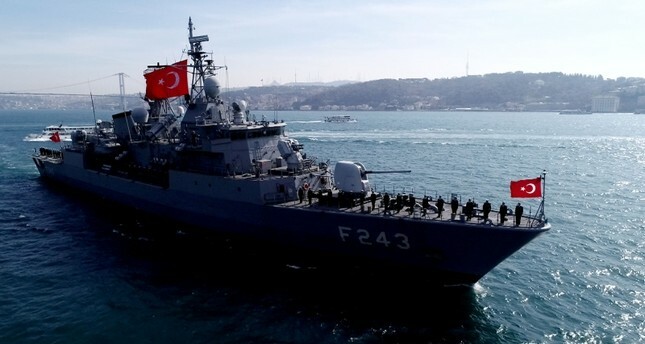 Eleven warships including TCG Barbaros, Oruçreis, Kemalreis and Yıldırım frigates, Burgazada and Bandırma corvettes, torpedo boats and submarines, returning from the Black Sea exercises of the "Blue Homeland 2019" drill, held in all three seas surrounding Turkey, crossed the Bosporus on Saturday to return to Gölcük and Aksaz naval bases in the northwestern province of Kocaeli and southwestern province of Muğla. A total of 103 warships and naval assets participated in the drill, which also took place in the Mediterranean and the Aegean. The crossing of the Turkish fleet allowed a fascinating view for Istanbulites, who had been enjoying the warm weather for the first time in months at recreation areas and venues on both sides of the strategic waterway. 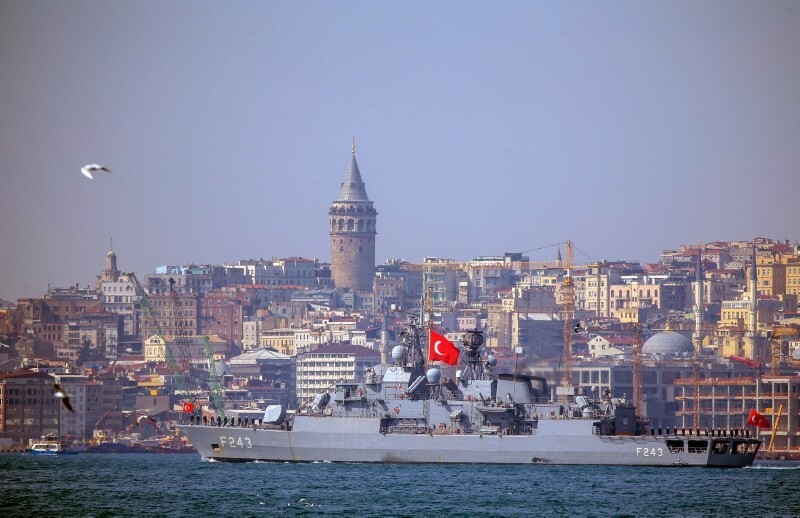 TCG Yıldırım frigate with Galata Tower in the background. TCG Kılıç torpedo boat with Süleymaniye Mosque in the background. TGG Martı torpedo boat with Hagia Sophia and Topkapı Palace in the background. Near their exit from the Bosporus, the warships moved closer to the western bank of strait to salute Barbaros Hayreddin Pasha, the famous sailor who marked the height of the Ottoman naval power in the Mediterranean, and whose tomb is located near the seafront of central Beşiktaş district. Born as Khizr in the Aegean island of Lesbos, Hayreddin and his brothers, namely Ishak, Oruç and Ilyas, all became seamen serving in the Aegean and the Mediterranean. Oruç, who actually had a red beard and was nicknamed "Barbarossa" by Italians, was initially the most famous name in the family, serving as a privateer then as corsair in the service of the Ottomans and the Mamelukes, attacking Crusader ports and fleets mainly consisting of the Spanish, the Venetians and the Genoese. From 1503 on, Oruç, later joined by Khizr and Ishak, was based in Djerba off the coast of Tunisia, acting with a certain level of autonomy while engaging Crusader forces in the Western Mediterranean. The brothers, often in cooperation with local rulers and participation of sailors throughout the Mediterranean, managed to conquer Algiers from the Spanish and offered it to the Ottomans, with Sultan Selim I appointing Oruç as the governor of Algeria. They became feared throughout Italy and Spain for their undaunted raids to fleets and ports while gaining the respect of many for their efforts in transporting exiled Muslims and Jews from Spain to various locations in Ottoman Empire following the Spanish Inquisition. The Spanish, the main opponents of the Ottomans in Central Europe (as rulers of Austria) and the Mediterranean theaters, launched an expedition to Algeria. Oruç and Ishak were killed in the Battle of Tlemcen in 1517. Khizr, now appointed senior provincial governor "Beylerbeyi," took the helm of Oruç, captured various Spanish-held ports in Algeria and Morocco and fended off Spanish-Italian efforts to recapture their lost possessions, while even raiding the Spanish and Italian mainland. After numerous successes and a cordial relationship with the Sublime Porte, Khizr was summoned to Istanbul by Sultan Suleiman I (Suleiman the Magnificent) in 1532 where he was appointed the Kaptan-ı Derya (Grand Admiral) and named by the Sultan as Hayreddin (Khayr ad-Din - best of the faith). This Ottoman-era miniature shows Barbaros Hayreddin before Sultan Suleiman I. In 1538, the Ottoman fleet under Barbarossa's command dealt a heavy blow to the Crusader Fleet led by Andrea Doria at the Battle of Preveza on the coast of western Greece. Until the heavy Ottoman defeat at the Battle of Lepanto in 157 that unfolded some 100 kilometers southeast, the Ottomans were virtually unopposed in the Aegean and the Mediterranean. Barbarossa also played an important role in establishing the Franco-Ottoman alliance against Charles V of the Holy Roman Empire, the ruler of Spain, Austria and their possessions in Italy and the Netherlands. Hayreddin helped the French to recapture Nice in a campaign and siege laid in 1543, while helping them to hold in their southern front through various attacks and raids on the Spanish and their Italian allies. The alliance lasted to some degree until Napoleon Bonaparte's Egypt Campaign in 1789. Barbarossa retired in 1545 and died soon after in 1546, and was buried in the tomb constructed by famed Ottoman architect Sinan in Beşiktaş at his will. In the spring, the Ottoman fleet setting sail from the historic Golden Horn Shipyard in Kasımpaşa neighborhood first anchored off Beşiktaş and visited the tomb, firing their guns in the honor of the deceased sailor. This practice featuring the maritime honorary salute known as "çimavira," became a tradition in the centuries to come, until the Tanzimat (Reform) period in the 19th century, when the Empire started suffering setbacks and retreats in all fronts. This year's salute was the first time in centuries that the Turkish navy saluted the famed sailor's tomb. During the period of Barbarossa's oblivion, the Islamic waqf established as part of his inheritance and its possessions in Beşiktaş, along with the tomb itself where dozens of his freed slaves were also laid to rest, was occupied by other structures. The area surrounding the tomb was later cleared in 1930 and 1940 in the early Republican era and organized as a square while the Istanbul Naval Museum, established in 1897, was moved to a new and larger complex right next to the square.